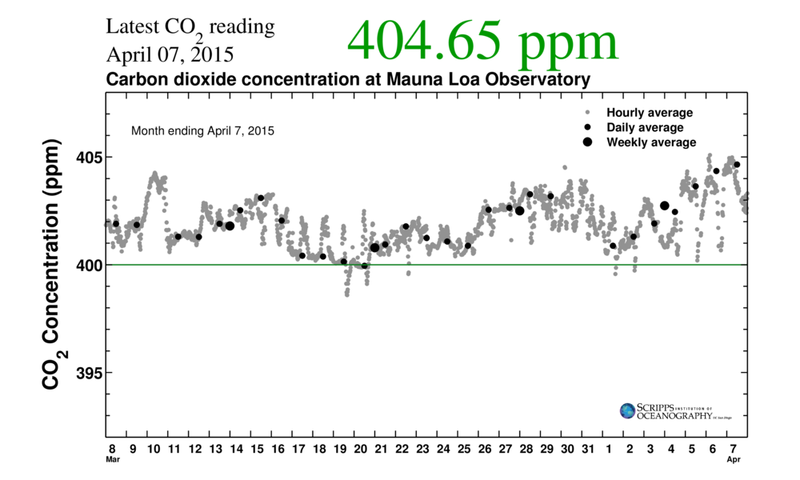 On April 7, 2015, the Scripps Observatory at Mauna Loa, Hawaii recorded a daily average reading of 404.65 ppm, a new all time high in their records for carbon dioxide at the site. The weekly trend is part of the natural movement for March-April, which saw carbon dioxide move up from the March 7, 2015 average of 401.71 ppm - an increase of 2.94 ppm in the last month. 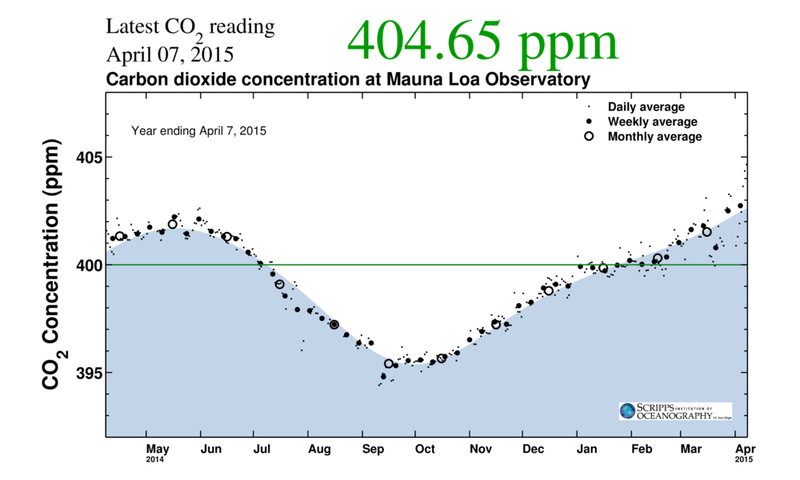 However, the yearly jump from April 7, 2014 is about 2.45 ppm, well above the expected annual increase of about 2 ppm. Some of this increase can be attributed to extra GHG emissions, however some may be due to increasing ocean temperatures, as depicted later. 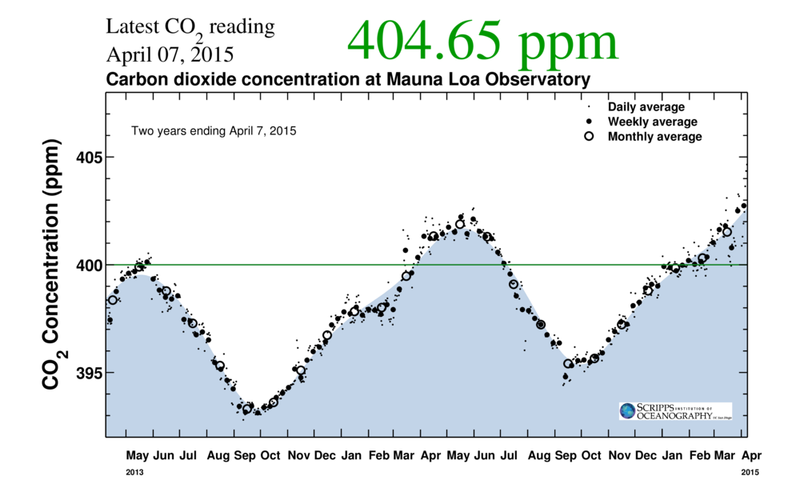 The two year trend is intact, with only one week averaging above 400 ppm in May, 2013, we can anticipate 4-5 months of average CO2 above 400 ppm at Mauna Loa this year. Will the MLO daily averages go higher this year - and by how much? Very likely! 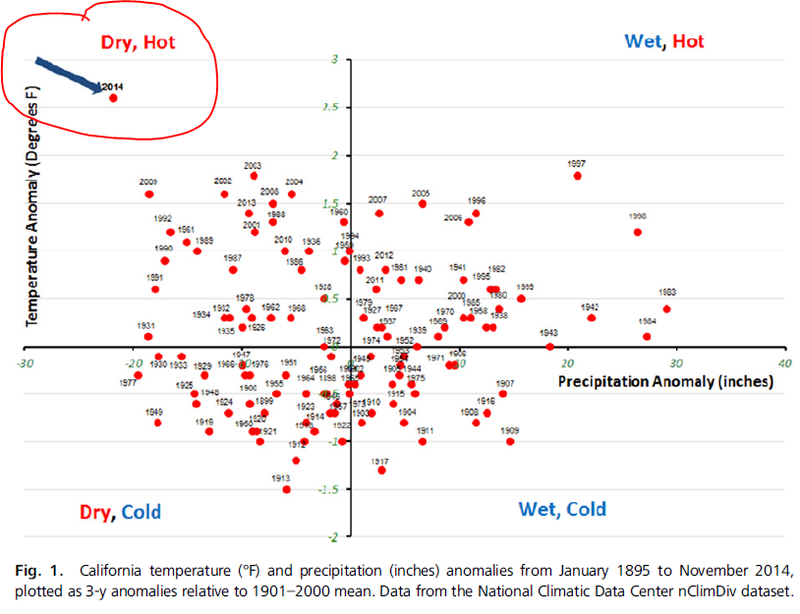 The highest daily average readings for MLO CO2 in 2014 were 403.10 ppm for NOAA on May 1, 2014, and 402.84 ppm for Scripps on May 31, 2014. If one were to presume a 2-3 ppm increase over last year, the highest daily averages will likely be over 405 or 406 ppm. A weekly average in May or perhaps early June will likely be over 404 ppm. However, higher anomalies are possible. 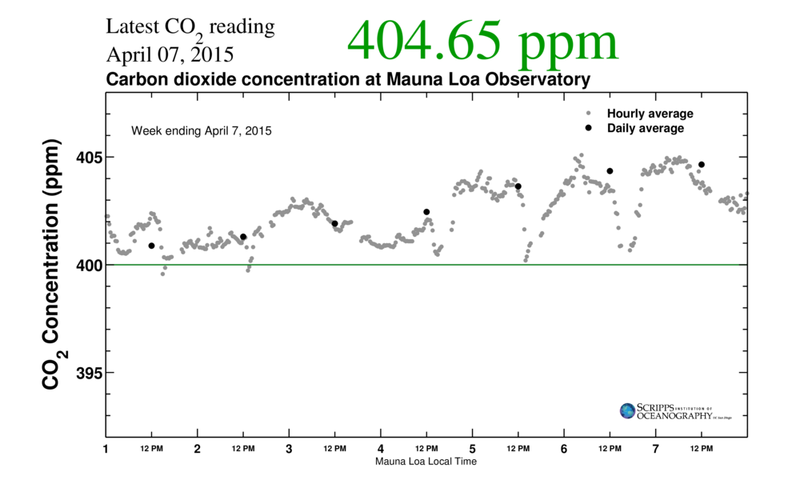 The CO2 average daily concentrations around Hawaii on April 7, 2015 reveal regional readings above 410 ppm. The deep reds reflect grids above 406 ppb and the purple above 410 ppb. 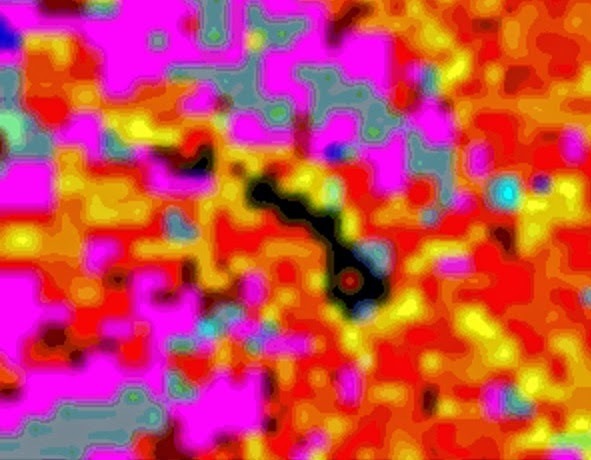 The detail above is from the METOP IASI 1-B layer below. As can be seen, the northern hemisphere CO2 is above 400 ppb in many regions. Ocean temperatures in the Hawaiian waters are well above the long term (1961-1990) climatological mean and may be enhancing the CO2 increase, along with the higher concentrations being transported from the Northern Pacific. 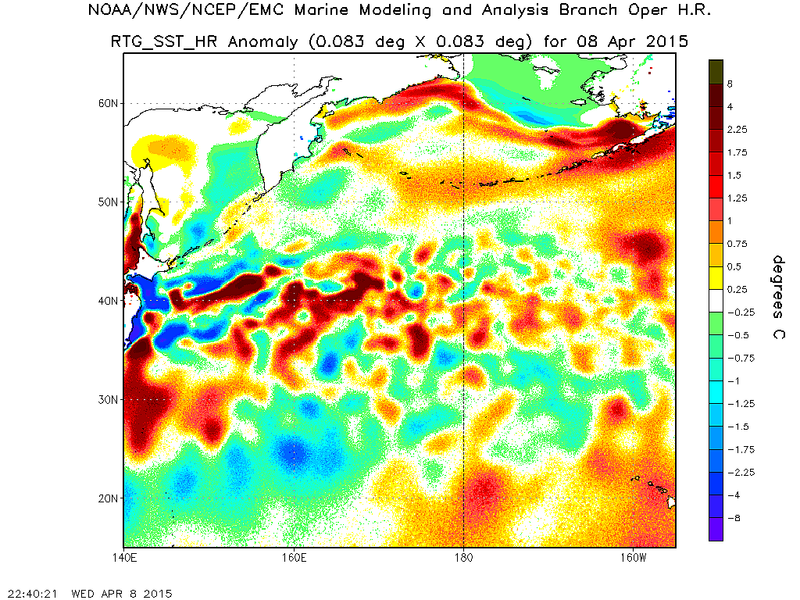 Sea surface temp anomalies around Hawaii currently appear to range from .25 to 1.25 C.
This sea surface temperature anomaly is not a regional concern alone, but global. 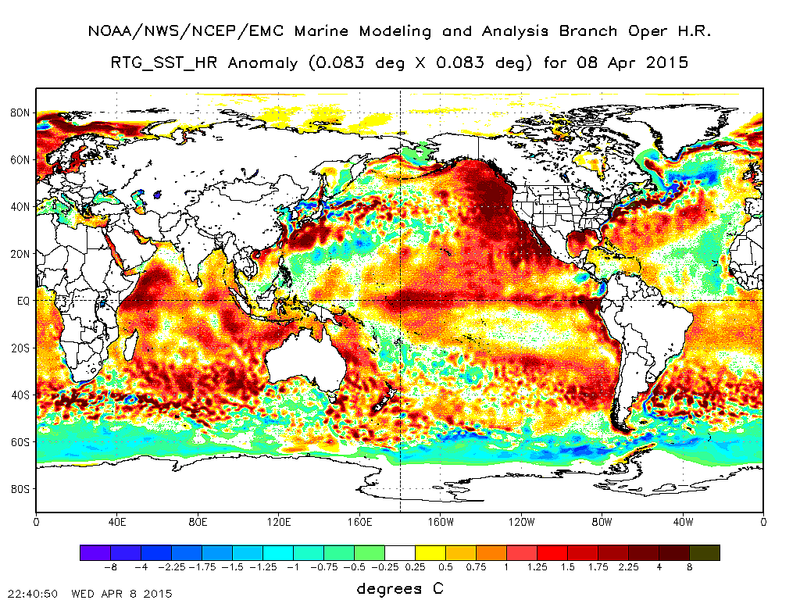 The NOAA EMC sea surface temp anomaly depicts global oceans into very troubled waters, and the impacts on CO2 increase are still to be seen.